The physical maintenance of a chainsaw is very important as we can all appreciate, however, good storage of your chainsaw will also help with good performance making sure it will start the next time you need it. 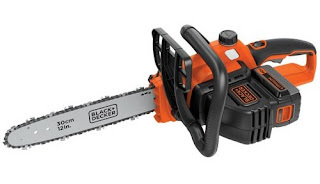 Chainsaw should be stored in dry and dustfree conditions. Cleaning it before putting it away for the winter will ensure that it's ready when you take it out in the spring. Empty the fuel tank in a well-ventilated place and then clean it. Remember to drain the carburetor first, to prevent the carburetor diaphragms from sticking together. Remove the chain and guide bar, give them a good clean and then spray them with protective oil. We like to use CRC . Your chainsaw should be kept in a dry place. Select an area which is well ventilated and protected from the weather. Leaving it outdoors is not advisable as it is more suspectable to rust and it really should be protected from the sun - it's UV rays can break down the plastics, making them brittle. The chain saw should always be packed away in a dust-free environment. You can place it in a dust bag or even a cardboard box or covered under a cloth. It's also a smart move to store it in a place where children cannot get their hands on it.